What do we need for a bass sound, and how do we break it down? In a typical application, the basic components we're going to want are a sound that has a solid fundamental frequency and medium-to-quick envelopes with a moderate sustain useful for quarter, eighth and sixteenth note playing. The components will vary widely depending on the specific musical context or genre such plus the desired brightness and overall tone -- is it a "harsh", "smooth", "analog" or "digital" timbre? And finally, how do we want to use velocity dynamics, and do we need monophonic mode for legato playing? The main thing to understand in regards to stacking our Modulator operators two or three deep is that, in general, you get more brightness, harmonic variation, and dynamic harmonic behavior as you start stacking Modulators. Going back into the history of FM with only sine wave operators, the waveforms you could create with a single Carrier and Modulator were fairly simple. When Yamaha developed the DX7, their important expansions on John Chowning's original FM implementation was having 6 operators, creating Modulator branches and stacks in their algorithms, and implementing Feedback. Stacking the Modulators allowed for the ability to modulate the Carrier with dynamic complex waveforms, instead of just a simple sine wave, and greatly expanded the array of sonic complexity available. Later on, Yamaha introduced complex waveforms directly available as operator waves in the TX81Z which allowed for a lot of harmonic complexity even though it had only 4 operators. * Sawtooth Type adds in all the integer overtones, as in a sawtooth wave, as you increase the feedback setting. * Square Type adds in only the odd-numbered overtones, as in a square wave, as you increase the feedback setting. Combined with some new unique algorithms, this allows for a lot of complex harmonic capability in a 4-Op sine wave FM engine. 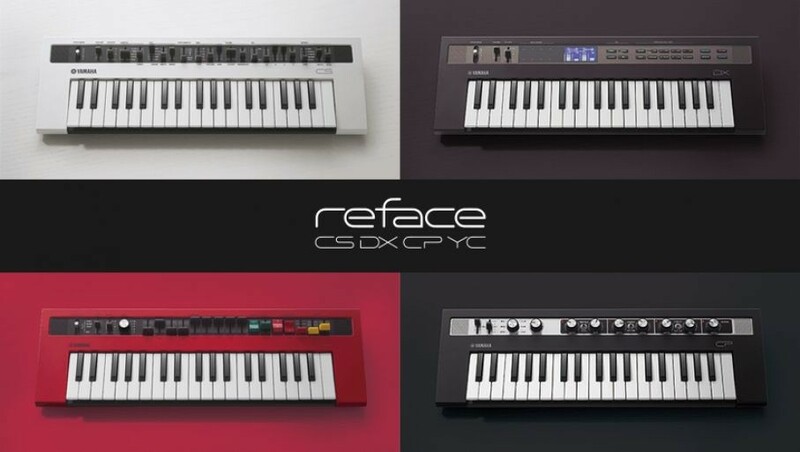 And in my opinion, this makes the reface DX an extremely versatile and capable synth for Bass sounds that rivals even the TX81Z. Back to our regularly scheduled program and time for an example... please reference the Voice "Synth Bass Example" along with the companion video on Soundmondo. I chose this particular algorithm, which is unique to reface DX, as I want to demonstrate later on some simple edits that drastically alter the sound and show how multiple stacked modulators work. Additionally, because this algorithm has both branched and multiple stacked Modulators and includes a 'shared' Modulator (Op 4), it can create unique characteristics in our sound, that we'll dive into later. Let's begin with the basic breakdown. In the Soundmondo editor, turn off all the Modulator Operators 2, 3 and 4. I'm creating our fundamental tone by having a little Feedback set at 25 for our Carrier Op 1. Set the Feedback to Zero and back to 25 to hear the difference between a pure sine wave (Feedback = 0) to the subtle overtones with setting the Feedback to 25. Now, turn on Operator 2 and listen to the sound so far. I'm starting to build the sawtooth/pulse timbre structure using a Frequency Ratio of 1.00 for Op 2, Level set at 83, a Feedback set at 63, but using the 'Square' setting for Feedback Type. Then, change the Feedback Type for Op 2 back and forth from Square to Saw and listen to the difference in the sound. Using the Saw type creates a typical sawtooth wave timbre, whereas the Square type creates more of a mixed sawtooth/square wave timbre. Next, turn on Op 4 (keep Op 3 off for now). Op 4 is set to a Frequency Ratio of 2.00, a Level of 55, and Saw Type Feedback set at 70. Now we have a three Op stack of Op 4 modulating Op 2, which then modulates our Carrier Op 1. Turn Op 4 off and back on and play notes to hear the harmonic richness and brightness added by Op 4. Let's hear the difference multiple stacked modulators make in our sound so far. As I mentioned in our earlier detour, in general, you get more harmonic variation and brightness. To hear this, keep Ops 1, 2 & 4 turned on, and change the Algorithm setting back and forth between Algorithm 4 and 5, which results in changing the patching of Op 4 from being stacked behind Op 2 to being patched directly into the Carrier Op 1. Listen to the difference in the sound – pretty big difference! Now, make sure you're back on Algorithm 4, and Op 2 Feedback Type is set to Square and Op 4 Feedback Type is set to Saw. Turn on Op 3. I'm using Op 3 to add a touch of extra brightness and 'snap' in the attack at the highest velocities, using a Frequency Ratio of 1/00, and a Level of 75, Square Type feedback set at 70 and a Velocity Sensitivity of 90. If you want to intensify the bright 'snap' contribution of Op 3, gradually increase its Level from 75 up to about 90-110. Again, go back and start switching the Feedback Type for Ops 2 and 4 and listen to the sound change, both with Op 3 Level at the original setting of 75 and set up higher in the 100 range. Play around, listen what happens as you start bringing up the Level of Op 4 to 70-85. Because Op 4 modulates both Ops 2 and 3 before they both combine back to each modulate our Carrier Op 1, and Op 3 has completely different Velocity and Envelope settings than Op 2. As I mentioned at the beginning of this article, choosing Algorithm 4 for this example allows for unique timbral changes by just switching the Feedback Types between Saw and Square for those three Ops and some minor Level tweaks. Make sure you watch the companion video for this Voice, as it will help keep things clear. So, hopefully you've got some understanding how stacking modulators and the different Feedback Types can have a large influence in your sound. Apply these concepts when tweaking all your sounds, not just Bass sounds, to find some nice 'haxidents.' I'll leave with one simple 'haxident' to try which drastically changes the sound because of those infamous quirks of FM math – take this original example Voice and just change the Frequency Ratio of Op 1 from 1.00 to 2.00 and be prepared for some big bottom end...! For two examples of fully tweaked-out, in-your-(re)face synth Bass sounds, check out "Facely Bass 1" & "Facely Bass 2". Some additional variations of synth Bass Voices on Soundmondo to expand your library are the "Yet Another FM Synth Bass" series: "YAFMSyBs1", "YAFMSyBs2", "YAFMSyBs3", "YAFMSyBs4", "YAFMSyBs5", "YAFMSyBs6", along with "Bass Byte." Until next time – happy tweaking! In the meantime, join us in the discussion about this lesson on the Forum here.